Are the £40 vouchers given with this? Yes you have to claim them back from Nespresso though and they send them in the post. Just thought I'd add you would get a 3 year guarantee included in the price. Thanks - just ordered one! For £60 (after the cashback) this is an absolute bargain! It doesn't look as though the £40 voucher applis to this machine. Special buy: These offers are available for a limited time only and are exceptional value as we've been able to secure one-off discounts from our suppliers. I would say that negates the £40 voucher discount. Good price shame the Nespresso club offer has expired as well. Probably better off getting the M100 model which comes with the aerocinno. This model does not seem to have the aerocinno. Aeroccino's cost £80 alone, so a better offer even though it's the older style machine. Cannot be used in conjunction with any otherNespresso promotion, offer or … Cannot be used in conjunction with any otherNespresso promotion, offer or discountSpecial buy: These offers are available for a limited time only and are exceptional value as we've been able to secure one-off discounts from our suppliers.I would say that negates the £40 voucher discount. Good price shame the Nespresso club offer has expired as well. I will add though that I brought this coffee machine when they had the other promotion just recently offering £40 Nespresso credit and I got that. The receipt does not show that it is on special offer. 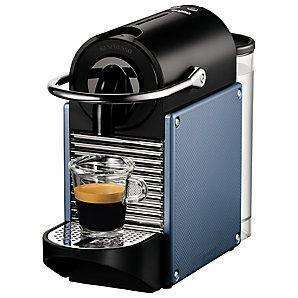 The price reduction is a John Lewis offer, not a Nespresso promotion so £40 voucher offer should still be valid. Plus there's a link to the offer on this product page which I used to print off the PDF Redemption Form. Good price. These machines are great, and we use ours daily. However, be aware the capsules are expensive..
Gutted just got mine from JL last wek for £125 :(Heat added! If that happens, I just buy a new one and return it with the first receipt. However, be aware the capsules are expensive..
29p to 33p each + water/electricity/wear on the machine, probably comes out under 35p a shot, while more expensive than a bag of ground coffee or beans, its cheaper than the chains and crappy coffee vans. I'd say its a good middle ground for people who want better than freeze dried crap but don't want the hassle of pulling espresso shots themselves. Older model with the Aeroccino for heating/frothing milk at the same … Older model with the Aeroccino for heating/frothing milk at the same price....http://www.johnlewis.com/231041345/Product.aspx?source=46387Aeroccino's cost £80 alone, so a better offer even though it's the older style machine. You're absolutely right - this is a MUCH better deal. From what I remember the Pixie range is their "second generation" machine which has a stronger pump, hence the difference in price for the Magimix one. I'll be getting the Coffeeduck re-useable pods and using freshly ground coffee most of the time, saving the superb Nespresso pods for Sunday best. Magimix and Krups are the same company, and the Pixie is available under both names. From what I remember the Pixie range is their "second generation" machine … From what I remember the Pixie range is their "second generation" machine which has a stronger pump, hence the difference in price for the Magimix one. Both come with 3 year warranty. What advantage does a stronger pump give? This 'weaker pump' one comes with an Aeroccino. It's a no brainer. Thanks OP for the heads up, but I have gone for the M100. Someone ought to post the deal for the M100. M100 is a scorching deal! Not so much for the pixie. Heat anyway. Is Aeroccino a seperate module or is part of the machine? Aeroccino is separate. I personally prefer that. Nothing special, only difference is you are getting JLP vouchers instead of Nespresso ones for the same. Disappointing since you can't spend the vouchers on the coffee on this occasion since JLP have no Nespresso boutiques. what size cup can you fit under the nozzle, the m100 look limited. Also i prefer the look on the pixie. is it worth getting one with pixie and aerocinno? Also gone for the M100 - thanks for posting. Also thanks to Corradoboy for the CoffeeDuck tip !! Aeroccino's cost £80 alone, so a better offer even though it's the older … Aeroccino's cost £80 alone, so a better offer even though it's the older style machine. To confirm the nespresso just does coffee? I know the tassimo does a lot more. How about this johnlewis.com/230…spx ? Anyone know if there is any difference between this model and the Krups model? I can`t believe the price of the pods, was going to get one until i checked. Handy little machine, I've been using these one time capsules off Ebay, they work fine with the Pixie. Depends on price of coffee used, including the capsule it works out from about 15p per cup for Taylors to 20p per cup for Illy's.